Engaging LIFEPAC 9th Grade Science emphasizes the important subjects of geology and body health. Students will study diverse topics like: Our Atomic World; Volume, Mass, and Density; Astronomy; Oceanography; and Scientific Applications. LIFEPAC 9th Grade Science offers a fun approach to learning so your student can easily fine-tune his understanding of physics! He will not only learn the laws of nature; but will also be rewarded with a sense of accomplishment as he completes each worktext. Each unit contains section objectives, vocabulary words, along with question and answer sections. 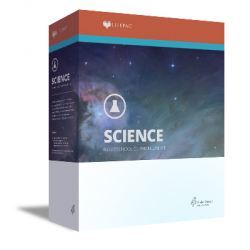 The LIFEPAC 9th Grade Science Set contains ten separate worktexts and a teacher's guide.